Hi there friends, hope you are having a fabulous week! I am currently enjoying a 'sun, sand and sea' holiday on the Sunshine Coast of Australia, just perfect! The last couple of weeks I've enjoyed many long walks, relaxing by the pool with a perfect ocean view, getting lost in a great book, exploring the coastline, visits to the farmers market and eating too much gelato (pink grapefruit sorbet, yum!). 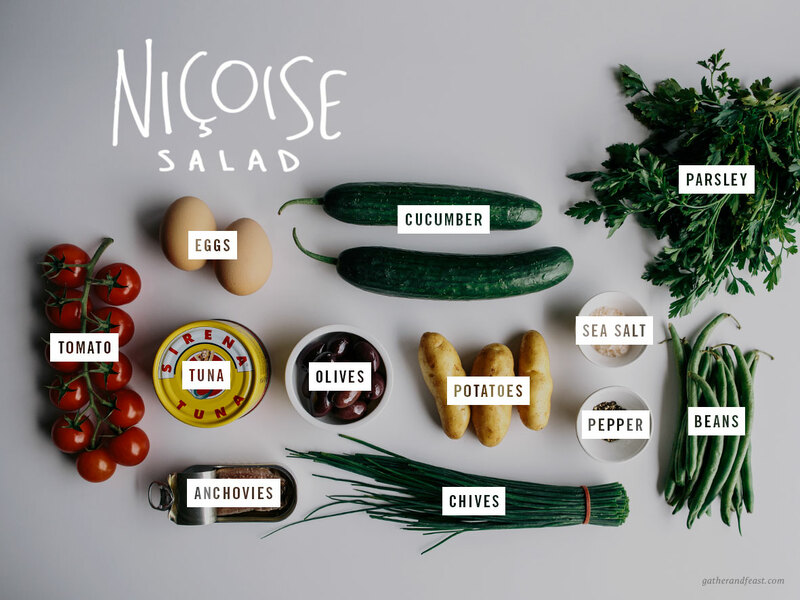 This week, I'm excited to share with you one of my favourite salad recipes, my Niçoise salad. This recipe is jam packed with lots of goodies... fresh tomatoes, tinned tuna*, hard boiled eggs, olives, anchovies, cooked kipfler potatoes and green beans. It's a meal in itself, and perfect for lunches, picnics and large gatherings. Fresh and quality produce is key to perfecting this simple dish. *I like to source a good quality tinned tuna and I find 'Sirena Tuna' to be the best in Australia. Place the cooked potatoes into a large mixing bowl and drizzle with olive oil. Add to the cooked potatoes some salt, pepper, half the chives and parsley finely chopped, and toss to combine. Place the eggs in boiling water and cook (4 minutes for soft eggs or 6 minutes for hard eggs). Once cooked, remove the eggs from the pot and peel them straight away, cut in half and set aside. Leave the beans for a minute or two then drain the water and set them aside. Place the potatoes, tomatoes, cucumber, beans and olives into a serving bowl, then add the tuna, anchovies and eggs on top. Drizzle over the vinaigrette and sprinkle with fresh herbs. Voi la! A delicious Niçoise salad. Sweet banana, salty dark chocolate and earthy roasted almonds, the perfect combination for a frozen sweet treat! I’m SUPER happy with how this recipe turned out! It's vegan, refined sugar free, and has gluten free potential.